We go through thousands of pita chips a month in our house. I know because I'm usually the one who makes them. Why do we go through so many? Because they're delicious, cheap, easy to make and better for us than potato chips. We snack on them with or without dip, I crumble them over the top of casseroles, they make great nachos and even better Haystacks. And did I mention they are cheap? One bag of pita bread will make a LOT of pita chips. 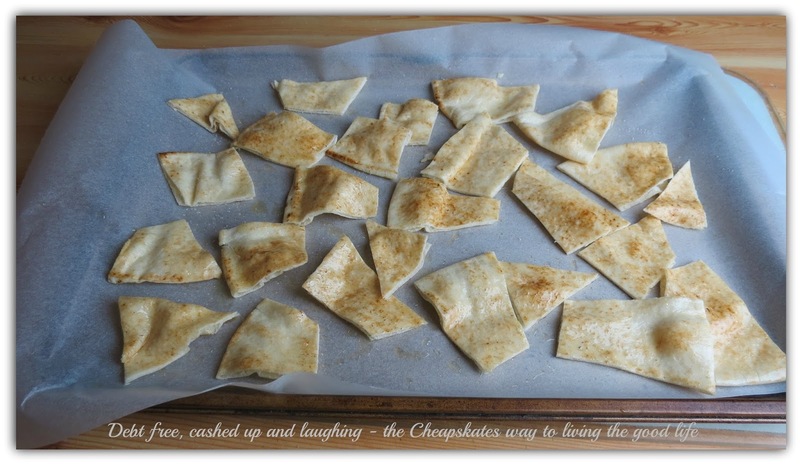 When pita bread is on sale I will buy a half a dozen packets and pop them in the freezer just for making pita chips. 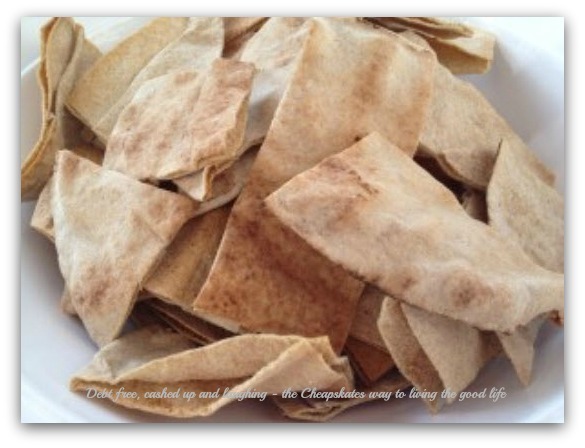 To make pita chips take a round of pita bread. White or wholemeal, it's your choice. Lavish that bread with olive oil. Be generous and coat both sides. This is important. The oil will not only crisp up the chips but give them a wonderful flavour. Sprinkle on any seasonings you might like. Herbs, onion flakes, garlic, salt and pepper, paprika - whatever you fancy. Don't fancy anything? Don't worry, leave them plain, they'll still be absolutely delicious. Cut the pita into chips. I use kitchen scissors to cut strips across each round. Then I cut each strip into chips. You might have another way of cutting the bread, it doesn't matter as long as you get it all cut up. Spread the chips onto a baking paper lined baking sheet. A single layer is best so they dry evenly. Bake them in a moderate oven (180 degrees Celsius) for 15 - 20 minutes or until they are golden and crisp. Take them off the baking sheets immediately and let them cool on cake racks. Once they are completely cool store them in an airtight container to keep them fresh. Any idea how long these stay fresh for? In an air tight container in a cool, dry pantry they will keep fresh for up to two weeks. They never last that long around here though. You can skip the oil step and bake the pita chips dry and they will keep a lot longer - up to a month in an air-tight container. I usually make a triple batch in early December to get us through the Christmas/New Year party/barbecue/visitors period and they keep beautifully. I never thought of cutting them with scissors. It is so much easier. I mix crushed garlic with the oil and sprinkle the bread with peri peri salt, garlic salt and cayenne pepper. I just made some without checking the recipe, I could remember the brush with oil bit , so I brushed after I'd split it horizontally, then sprinkled with salt and zatar I'd got from a parent club stall. Yummy. Very yummy. I'm now trying cooking in a circle and I'll break when they're crisp and cooled to see how they go. How about sprinkling with sugar and cinnamon to make dessert nachos. Yummy. Why oh why didn't I try this sooner??? Simple and super tasty. I dont think I'll ever buy crackers or potato chips again! What timing! Pita bread is 99¢/pack at my local fruit and vege store. I found half a pack in the freezer this morning.. and I ran out of potato chips to have with my treat of Coles onion dip. Crispyness with less calories -- I like it! I just made these tonight. 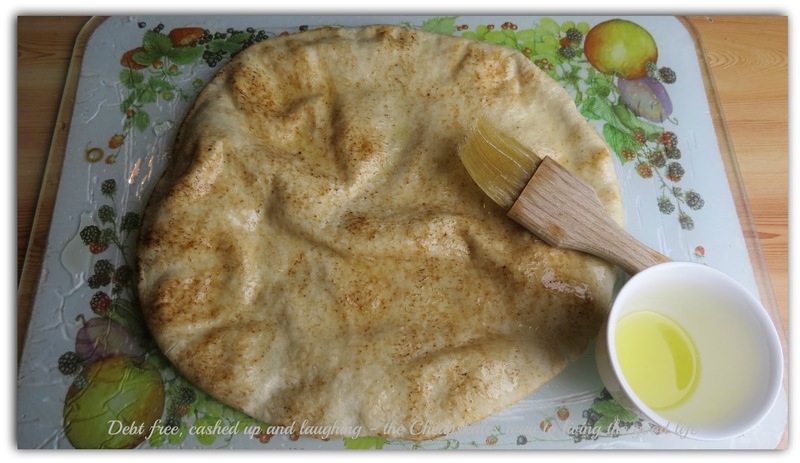 (I bought some Pita bread last fortnight but the kids got into it before I had a chance to make them.) My oven is FF so I think next time I will reduce the cooking time by at least 2 minutes. I sprinkled half with Herbamare and left the other half plain. I think I ate half before I put them into the kids snack containers for school tomorrow!! Brilliant. Brilliant. Brilliant. The combination of flavours is endless. Final Chance to attend the Lets All MOO Workshop! MOO Monday - Ants Be Gone!